The Award Winning interactive mathematical problem-solving game series. Challenge and engage your students with interactive activities, in Number Theory, Fractions, Percents, Geometry and more! LearningWave Online - Creative interactive puzzles, games, logic problems. An education site based on middle school national standards to build math skills. LearningWave Online is a comprehensive mathematics and education site, meeting the needs of parents, students and educators. for subscription sale, which enables educators as well as parents to help students learn math. Better? As a highly interactive site, LearningWave Online uses the full power of the internet with pages programmed specifically to not only teach students but to reward them as they reach their learning goals. Also, part of LearningWave are links to the best educational and parenting sites on the web. Featured within the site are the award winning pre algebra Games of Absurd Math as well as the geometry oriented Challenge of the Seven Cups. 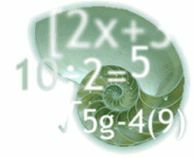 An online calculator is also available to assist students and the free challenge, Problem of the Week. Tour the online catalog and see our many award winning mathematics products.